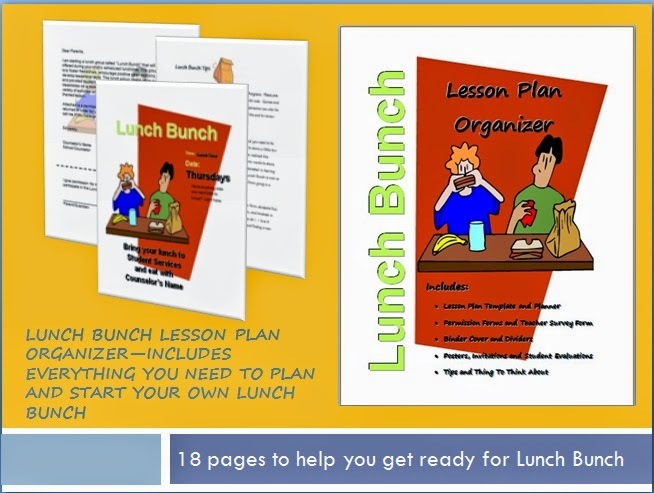 Need Help Putting Together a Lunch Bunch Program? Need Help putting together a Lunch Bunch Program? I put together this TpT Lunch Bunch Lesson Planner. It has everything from Lesson Plan templates to a Teacher Survey, Post Group Evaluation Form, Group Rules, Confidentiality Poster, Invites, a Parent Letter, Attendance Tracker, and How-to Tips. Everything is editable, so you can customize you letters and forms to fit your exact needs. I also designed this to help with RAMP certification, and to meet ASCA standards in putting your program together. Need Lessons or ideas? Join one of the groups below (and keep following this blog or search Lunch Bunch on the side bar) for more ideas. Is there a link that i can access your templates for Lunch bunch? I was looking for a link as well. Is there not a link because it is posted on the Facebook page?